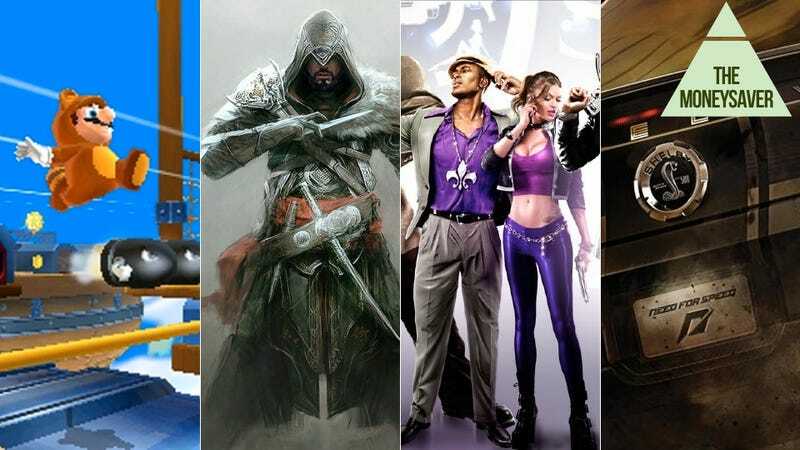 Savings and bonuses for new releases for the coming week's jampacked lineup, including Assassin's Creed: Revelations and Need for Speed: The Run can be found inside this weekend's edition of The Moneysaver. And if you haven't picked it up yet, there's one for Skyrim, too. • Dream Pinball 3D is $3.77, save 62 percent. • Gray Matter is $14.25, save 52 percent. • Rift Ashes of History Collector's Edition is $19.99, save 50 percent. • Mafia II is $20.37, save 32 percent. • Clutch is $5.00, save 50 percent. • Mount and Blade plus Warband Bundle is $11.25, save 75 percent. • Call of Duty 2 (Mac) is $14.95, save 50 percent. • IREM Arcade Hits is $7.49, save 50 percent. • Gobliiins Trilogy is $2.49, save 50 percent. • The Settlers Complete Collection is $24.00, save 60 percent. • Assassin's Creed Complete Collection is $39.97, save 50 percent. • Gothic Complete Collection is $49.99, save 38 percent. • Prince of Persia: The Two Thrones (Mac) is $9.99, save 67 percent. • Men of War is $2.49, save 75 percent. • Hacker Evolution is $11.21, save 25 percent. • Cities in Motion is $15.96, save 20 percent. • Alien Shooter II - Vengeance is $8.46, save 15 percent. • Syberia is $3.99, save 60 percent. • Moto Racer is $2.39, save 60 percent. • Final Fantasy XI Ultimate Collection - Abyssea Edition is $9.99, save 50 percent. • Atari 80 Classic Games in One is $7.49, save 50 percent. • Earthworm Jim 3D is $4.99, save 50 percent. • Real Soccer 2011 (iPhone) is $0.99, save 80 percent. • World of Goo (iPhone) is $0.99, save 67 percent. • Dead Space (iPad) is $4.99, save 50 percent. • DeathSpank (Mac) is $4.99, save 67 percent. • The Baconing (Mac) is $6.99, save 53 percent. • DiRT 3 is $24.99, save 50 percent. • F1 2011 is $24.99, save 50 percent.